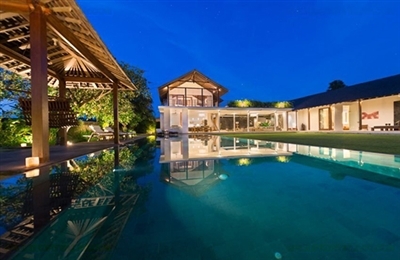 This stunning contemporary villa, with its sensational setting, is as far south as you can get in Bali. All that lies between Villa Hamsa and Australia is a lot of glittering ocean! In the evening the chef prepared a delicious dinner for us that was more than a match for Bali’s celebrity restaurants. Given the villa’s semi-remote setting – definitely no restaurants within running distance – in-villa food commands centre-stage, and this highly talented chef certainly made sure we happily stayed put rather than head out to the seafood restaurants of Jimbaran or Nusa Dua! 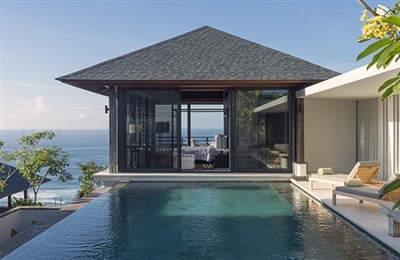 Though this is a four-bedroom villa that can accommodate up to 10, its layout is such that it would equally suit a couple seeking extra privacy and space; they would be very comfortable here without feeling they were rattling around, as the other three bedrooms are hidden out of sight below the pool and master pavilion – you hardly notice them. 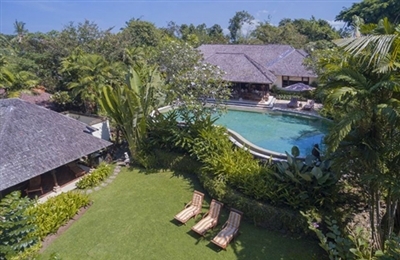 If you’re looking for nightlife and shopping, Taman Ahimsa is probably not the villa for you, but if you want to retreat from the world, awaken your soul, practice yoga and meditation, eat healthy food and experience therapeutic massages, this transformative place will inspire you more than you ever imagined possible. Even if you’re not really into the spiritual concept, and you don’t understand much about chakras, mandala thankas, crystals and healing circles, you will still appreciate the beautiful close-to-nature setting, the sight and sound of the sea, the romantic architecture and the peaceful ambiance. 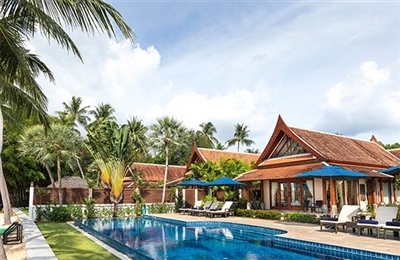 Although the villa promotes the holistic concept, you don’t have to be on a spiritual retreat to come here; but who knows, you might just be inspired to experience something new. The gardens and interiors are fun to explore too, in every room we found a traditional Balinese instrument, an extraordinary crystal or an antique, or a funky lamp or table. Floors and doors are made from old teak, ironwood and two-toned tamarind wood, which has been recycled from boats and old buildings. Please note the villa has a no smoking policy. 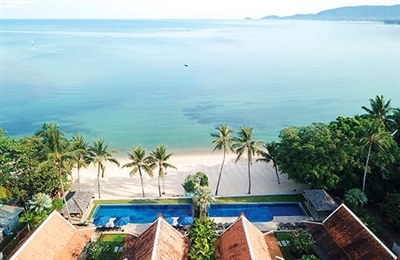 Taman Ahimsa is managed by Fivelements, a company that specialises in holistic healing retreats, centred at Puri Ahimsa, 20km away. 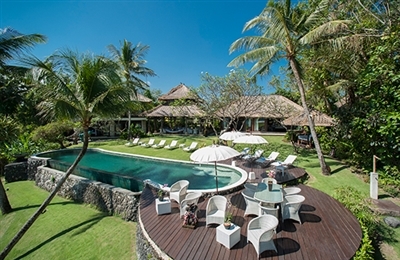 For a truly amazing experience arrange for the villa’s driver to take you to Fivelements Puri Ahimsa for a holistic treatment performed by an authentic Balinese healer. The Balinese equivalent of an English ‘Rose Cottage', this simple villa is enveloped by trees and traditional Balinese plants and flowers making it a paradise for birds as well as for guests. The stream at the garden end adds a wonderful background accompaniment. This villa is all about relaxing and letting the world go by. The strong teak furniture, terrazzo floors (slippery when wet) and alang alang roofs give the whole place a wonderful warm sepia feel, albeit an ever so slightly musty one. We loved the place and could happily overlook the many imperfections of age (a holed floorboard or a loose plug) for the overall soothing effect Villa Frangipani had on us: it was clear a week would pass all too quickly here. 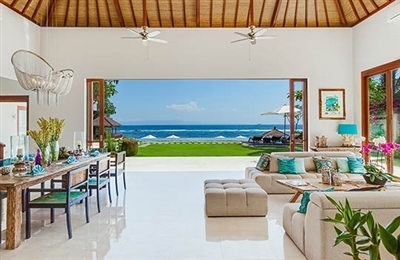 Perhaps the rooms were a little too sparsely furnished – some more bright art would go a long way to offsetting the very natural tones – and the lack of mod cons might bother some guests (the TVs and stereos in the villa are pretty ancient!). As with most villas in Bali, the mosquito nets were welcomed, although not as necessary as you might anticipate given all the wildlife in the gardens (expect frogs and even the odd monkey). A quick read of the guest book gives you a clear indication that guests (both kids and adults) have loved their stay at Villa Frangipani – the general themes: a warm friendly staff and a relaxing ambience: a great place for a family or two to recharge. Upon our return it was nice to find that the Wi-Fi was now complimentary. Apart from that it is still the country idyll that it always was with the only alien sounds being from the occasional plane flying high overhead. What a pleasure to be back.